"Chakra" is a Sanskrit term and refers to an energy vortex of varied speeds and color which works at various levels throughout the body. Chakra balancing which assumes great importance in view of promoting an individual’s physical and mental health can be done only by healing the chakras. Yogis use actual divine spiritual energies to increase the blood flow to the chakras even without touching them thereby activating the entire nervous system. The art of Chakra Healing and Balancing has its roots in ancient times when spiritual Gurus used to open the Brow Chakra of their disciples which is called as Shaktipat Yog. 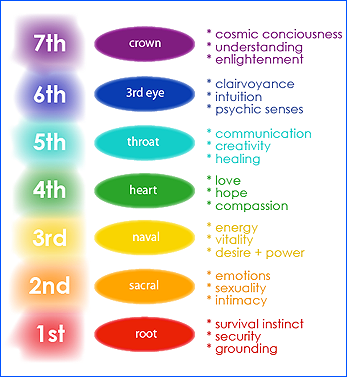 Knowing the seven chakras is essential for any spiritual healing to take place. This chakra lies at the spinal base and governs basic instincts of survival, sexuality, and stability of individual. Symbolized by color red and element earth, it gives material success, vitality and security if balanced. Located near the navel, this chakra governs emotional instincts and reproduction. Symbolized by color orange and element water it is essential for harmony and tolerance in relationships of individual. Located at bottom of rib cage, this chakra governs solar plexus, pancreas, digestive system and nervous system. Symbolized by color yellow and element fire, it gives a more disciplined approach to life. An intersecting point between top and bottom chakras, this is a chakra of encompassing love. It governs the circulatory system; green is its color and air, its element. Located at base of throat, this chakra governs the wellness of any organ connected with throat and promotes blending of elements. Located at your forehead’s center, this 'third eye' determines the extent of individual's clairvoyant ability. Situated on top of the head, this chakra influences individual's capacity to connect with the Supreme force. 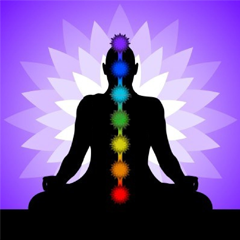 Chakra Healing and Balancing is a course of 7 sessions for seven chakras done on one to one basis. Each session will consist of a combination of Special Sitting and Yog Kriya which will be done for each individual chakra. Special Sitting : In this sitting Mr. Patil would be doing healing and balancing of the chakra by placing his palms on the person’s body where each individual chakra is situated. This sitting will be for 15 minutes. Yog Kriya : In this sitting the patient’s complete body, mind and soul is activated with divine spiritual energies.This sitting will be for 10 minutes. Contact us for more information regarding Chakra healing and balancing or to book an appointment.